The life cycle of hazard and risk occurrence (including other types of occurrences) encompasses the entirety of an adverse event to final consequences. The process that follows the hazard/risk occurrence life cycle is the issue management life cycle. 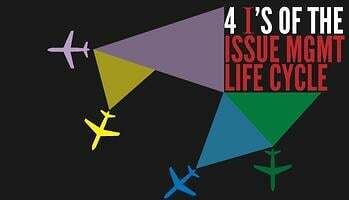 The issue management life cycle includes all the steps management takes from identifying an issue to fixing the issue (and beyond this, monitoring the fix). Various aviation compliance agencies account for this life cycle with various names, such as the FAA’s Safety Assurance process. Implement changes that fix causes via corrective actions. Here is a more detailed look at each of these stages. Ingesting issues is the basis of issue management. Without issue reporting, there is nothing for managers to manage. Therefore, ingesting is critical to the continued improvement of SMS. The extent and quality of issue ingestion depends largely upon hazard reporting culture. The act of reporting is how your SMS “ingests” issues. In this manger, building your issue management process begins with promoting aviation hazard reporting culture. As each report comes in, managers need to thoroughly investigate the problem. In essence, investigating the concern involves establishing the life cycle of the issue in question. If applicable, the adverse events and consequences that resulted from the hazard occurrence. An appendage to investigating the issue is assessing the issue, which necessarily depends on investigating all aspects of the issues. Once an issue has been investigated, managers need to figure out how to fix the problem. This involves taking all findings from the investigation and highlighting the primary elements that negatively affected the problem. Reinforcing risk controls to mitigate the threat(s) once the hazard has occurred, and therefore prevent risk occurrence(s). Figuring out how to introduce changes in operational environment to prevent the problem from happening again. Further risk assessments to ensure that proposed solutions actually fix the problem. These “fixes” are done through corrective-preventative actions. Risk controls implemented to fix the issue. Creating or updating new resources in the operational environment (i.e., new software, updated machinery, etc.). Once these changes are implemented, they will need to be reviewed and monitored as a part of overall system monitoring.